Attention. Music on the service is hosted based on license agreements with the copyright holders. In order to legally listen to tracks that are uploaded from your computer, make sure that the copyright holder has allowed the tracks to be hosted on Yandex.Music. Tracks you upload are marked with and are accessible only to you. You can't share them with other Yandex.Music users. If you create a playlist out of tracks you uploaded and share it with friends, they will get an empty playlist. You can't download tracks on the Yandex Music website, but you can download music in the mobile app and listen to it offline. For more information, see the “Offline mode” section of the Yandex Music Help for iOS, Android, and Windows. Yandex.Music will match the track names in the list to its own catalog. You can save any tracks it finds to your library individually, or add them to an existing or new playlist. If it turns out that you have more than 10,000 tracks to import, the service will divide them into multiple playlists. Note. If Yandex.Music doesn't have rights to an imported track, the service will select a track that is as close as possible or a different version of the track. In social networks, you can only post links to tracks, albums, or playlists. 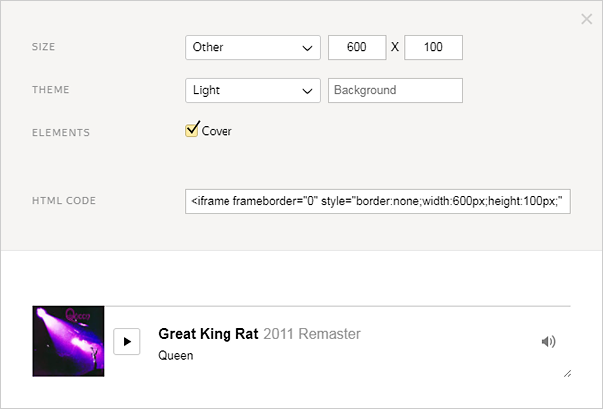 On a blog or site, you can also embed a player to listen to tracks without switching over to Yandex.Music.